Change of Japanese Emperor could lead to increased volatility in emerging markets. Turkey is the most exposed market. Mid-April is the most dangerous. On April 30, 2019, Emperor Akihito of Japan will abdicate, bringing to an end the Heisei (universal peace) era. He will be succeeded by his son, Crown Prince Naruhito, whose accession as the 126th Emperor on May 1 will restart the Japanese calendar with a new era (name to be announced on April 1). The Japanese Emperor is a purely constitutional and symbolic monarch, rendered wholly powerless by the US-authored Japanese Constitution, and we would, therefore, ordinarily expect little effect outside Japan from such an event. However, the Japanese government, in their decades-long effort to persuade their citizens to have more fun (and, in consequence, to spend more money and kick the economy out of its 25-year slump) may have unwittingly laid a major trap for emerging markets. Japan has long been a major contributor of capital and of liquidity to international financial markets. The Bank of Japan estimates (all JPY balances in this article from the Bank of Japan end 2018 funds flow report, unless otherwise specified) that as of 12/31/18, Japan had gross financial foreign assets of ¥1,006 trillion ($9.15 trillion) and net foreign financial assets of ¥342 trillion ($3.11 trillion). Just as with any developed economy, there are seasonal events which cause withdrawals of liquidity from the markets - think Thanksgiving in the US. Japan doesn't celebrate Thanksgiving - its equivalent is Golden Week. Golden Week is the combination of four national holidays (Showa Day, commemorating the Emperor Hirohito, Constitution Memorial Day, Greenery Day and Children's Day). Occurring annually on April 29 and May 3-5, these holidays are one of the few periods when the notoriously leisure-averse Japanese take time off and enjoy a vacation. Naturally, financial market participants are well aware of this regular event and plan for the ensuing lower levels of liquidity. This year, however, is special. Due to the change of Emperor discussed above, the Japanese government has declared 5 additional national holidays, thus extending the effective holiday period, after allowing for weekends, to cover well over two weeks - April 20 to May 6. From a financial markets perspective, Japan will be effectively closed over that period. At this point, it is worth considering another Japanese policy - the zero interest policy implemented by the Bank of Japan, with the full agreement and cooperation of the government. I do not propose here to go into an extended discussion of that policy - suffice it to say that the implementation of that policy aims to hold 10-year government (JGB) rates at 0.1% or below, and, as a consequence, short-term rates are consistently at 0% or below. The resultant compression of almost all yen-based financial yields has created a great problem for Japanese households. Japanese households have a huge financial surplus - net financial assets of approximately ¥1,509 trillion ($13.7 trillion). They tend to be relatively conservative when it comes to making long-term investments - many still traumatized by the 80% fall in the stock market between 1989 and 2009 - which explains why more than half - ¥984 trillion ($8.95 trillion) - of household gross assets are held in cash and/or bank deposits - a far greater proportion than in other developed economies. 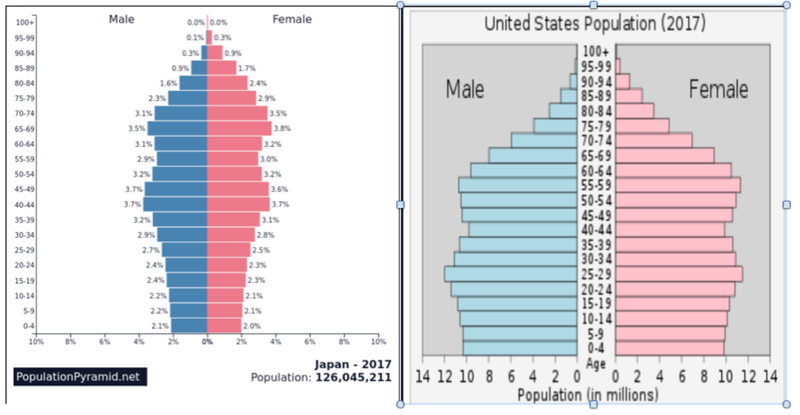 And, perhaps most importantly, they are old - Japan's median age is 47.3, almost 10 years older than the US 38.1 - and there are few young Japanese to fund the looming retirement of the older cohorts. Japanese households are therefore highly incentivized to grow retirement assets. The net result is a population eagerly searching for yield, but distrustful of domestic term assets. Many Japanese households have decided to turn to foreign currency assets, especially in high-yielding currencies. It is difficult to figure how much of the ¥984 trillion is held in foreign currencies. However, the balances are large enough in certain currency markets that foreign exchange traders have given the Japanese FX retail sector a convenient, if irreverent, nickname (which this article will hereafter co-opt) - Mrs. Watanabe. This refers to a) the tradition that Japanese households' finances are managed by the wife while the husband goes out to work, and b) the most common family name in Japan is Watanabe. It is important to note that these are not Asian countries. The result is to increase Mrs. Watanabe's influence on price movements as she prefers to (and is often constrained to) trade during Tokyo business hours when the home financial markets and the primary international center (New York for Brazil, London for the other two) are largely closed. 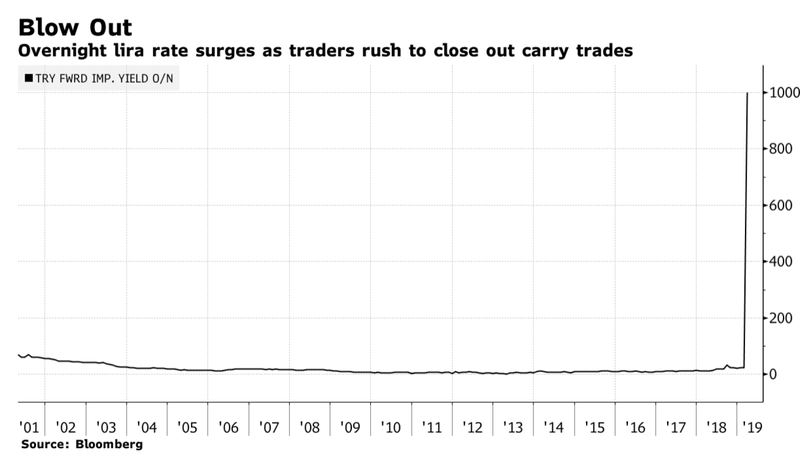 Recep Tayyip Erdogan has led Turkey (Turkish stock market is tradable in the US through the iShares fund (TUR) for the better part of 20 years. However, since the attempted coup against him in 2016, and the 2017 constitutional referendum in which he successfully asked the Turkish people to transfer much additional power to the office of Executive President, which Erdogan holds, his economic policies have become increasingly unorthodox. Turkey is a substantial capital importer - some commentators have suggested they need $150 billion per year - but is not a commodity exporter, so the foreign capital is largely used for and repaid by the domestic lira-based economy. This makes Turkey very sensitive to movements in the exchange rate - if the currency falls, their foreign currency liabilities immediately increase, while their lira-based domestic income increases slowly, if at all. This is a difficult situation at the best of times. When combined with an economically illiterate President who thinks that the answer to inflation and a depreciating currency is to cut interest rates, it can lead to disaster. And in Turkey's case, in 2018, it did. Turkey's currency has suffered constant and chronic depreciation. It has depreciated by about 80% since 2010. 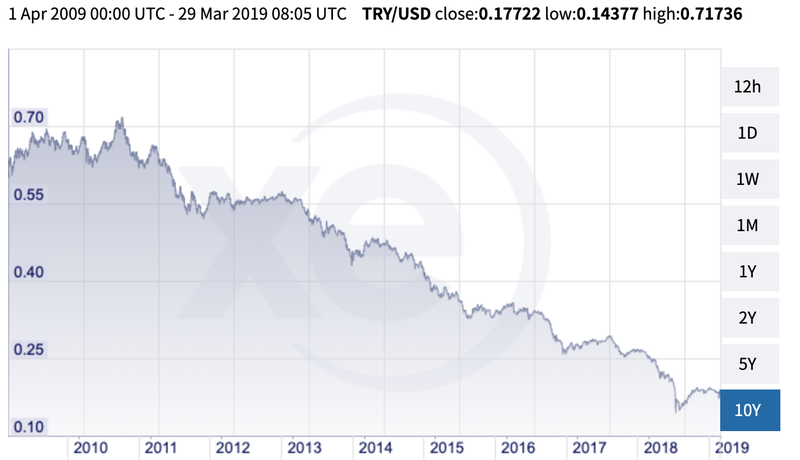 But in mid-2018, as President Erdogan, playing to the electorate in advance of June elections, decided to mount a direct assault against central bank independence and usury in general, things got much worse in a hurry. In the four months between April 2018 and August 2018, the lira lost more than 40% of its value. This got the attention of Mrs. Watanabe, who stuck with Turkey almost to the end of that period - yen/lira trading volume was still a massive ¥1.4 trillion ($12.6 billion) in June 2018 and lira-denominated issuance in the uridashi market was approximately $3 billion equivalent in the first 7 months of 2018. However, on the morning of August 10, 2018, Japanese investors awoke to read a speech by President Erdogan in which he spewed defiance at foreign criticism and said that while Turkey's opponents may have the dollar, Turkey has "our people, our righteousness and our God." Mrs. Watanabe apparently did not view this as effective foreign policy and ditched the lira in a big way. The Turkish currency fell 13% that day, as Japanese retail investors cut their long lira positions by approximately one third. However, Mrs. Watanabe is of a forgiving nature, and it appears that, as the lira has somewhat recovered, so she has rediscovered her appetite for lira assets. 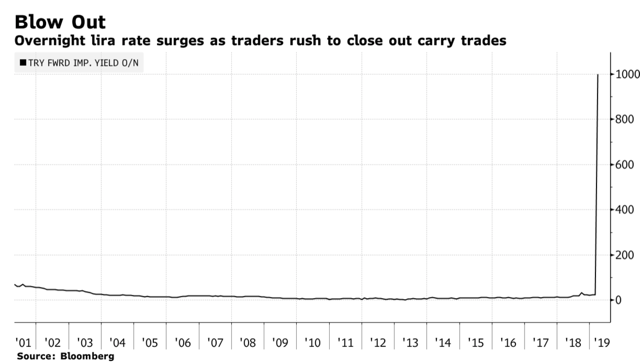 While aggregate data is not easily available, trends can be discerned by looking at volumes on the Tokyo Financial Exchange, which, inter alia, allows retail investors to trade currency futures with a 25:1 leverage ratio. After plunging from approximately 300,000 contracts (each 10,000 lira) to 200,000 during the August crisis, open interest is now back well above 300,000. Is history repeating itself? President Erdogan certainly seems to intend so. Again, there are elections (this time provincial on March 31). Again, he is making speeches attacking banks and speculators, and offering up dubious economic theories. 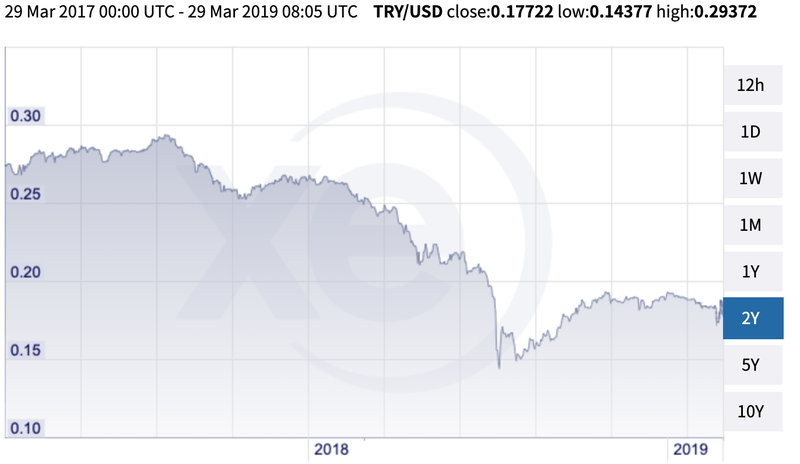 However, this time he is exacerbating the situation by attempting to execute a short squeeze on currency speculators - driving short-term offshore lira rates to over 1,000% - and thus spooking the equity market. Viewing this chaos and uncertainty with the painful memory of August's losses still fresh, it is very unlikely that Mrs. Watanabe will choose to leave her lira positions at their current elevated levels over the extended holiday period. President Erdogan may find that his problems with invading Western shorts will soon pale beside those caused by departing Japanese longs. Investors in Turkish assets and/or currency must already be concerned by the volatility and lack of liquidity in this market. As we approach mid-April, they should be mindful of the likelihood that Mrs. Watanabe will be closing her books, powering down her trading platform and going on an extended vacation to celebrate her new Emperor. From President Erdogan's point of view, she couldn't have picked a worse time. Disclosure: I/we have no positions in any stocks mentioned, but may initiate a short position in TUR over the next 72 hours. I wrote this article myself, and it expresses my own opinions. I am not receiving compensation for it (other than from Seeking Alpha). I have no business relationship with any company whose stock is mentioned in this article.